What causes brown edges on rose petals? Brown edges on petals are usually caused by thrips. Thrips are tiny chewing insects that are about 1/16 inch long, with a diameter the size of a hair. Thrips are usually found on light colored roses, whites, yellows and pinks. The female drills a small hole in the bud at the sepals and lays her eggs in the developing petals. The egg hatches in a few days as the bloom matures, providing the larva juices to grow. Thrips cause the flower to be deformed. Sometimes they prevent the flower from opening. The petals appear to be brownish around the edges. Thrips can be controlled by spraying – only the bud – with a good systemic spray. Brown edges on the leaves are usually caused by salt burn. This is a common problem caused by a buildup of salts in the soil. Salts can accumulate from ineffective watering practices or if an excessive amount of fertilizer is used. You can avoid this problem by periodically watering slowly and deeply to leach the salts past the root zone. Always follow the instructions carefully on fertilizer containers and do not over apply. Always water thoroughly before and after fertilizing to help prevent burn. I love your list of “best roses” and like to use it as a reference when I am buying a new rose bush. 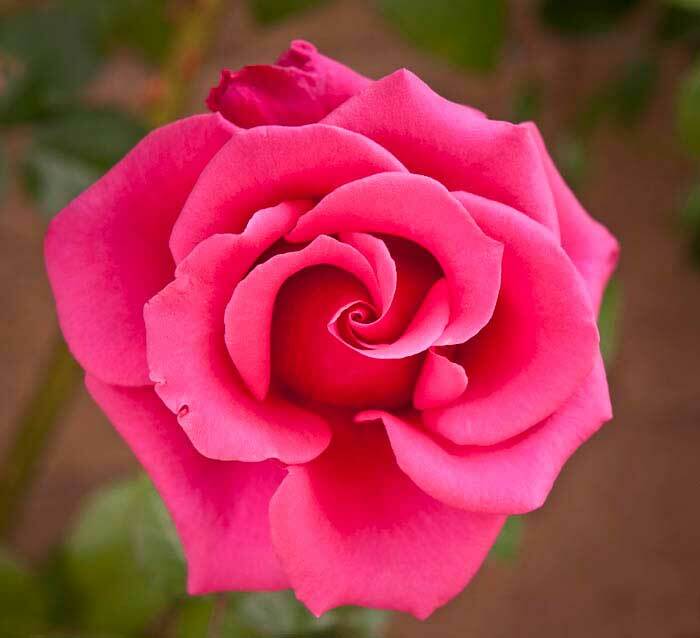 I want to find a deep pink hybrid tea rose that does well in our heat. “Hot Princess” seems perfect, but none of our local nurseries carry this rose or intend to get in in stock. Is there a source that you can recommend? I have never purchased from an online nursery and do not know about the quality of their roses. Thanks for your help! The only source I know for Hot Princess is K & M Roses. One of the best deep pink roses is Miss All-American Beauty. Also First Prize, Signature, and one of the prettiest – In the Mood, a deep red rose color. All of these roses can be found in the Phoenix area at Berridge, Baker and other local Nurseries. 2014 Rose Auction Catalog and Rose List! 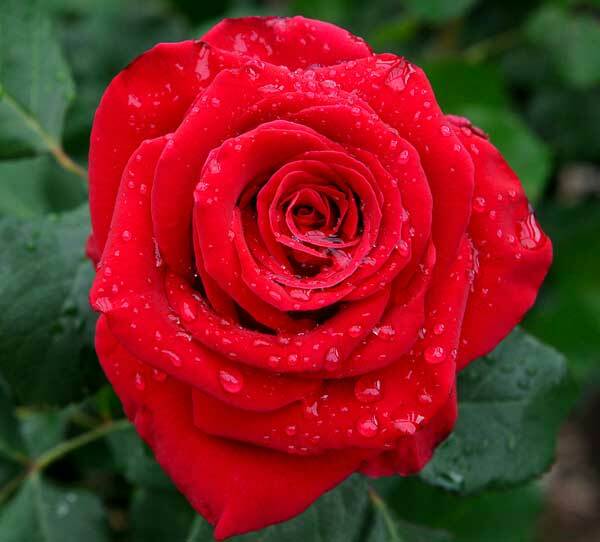 We have an updated Rose Auction Catalog and Rose List! View them here: Rose Auction. The auction is Saturday, February 1st, 2014. I saw two of my favorite roses on the list. Here’s Angel Face. This 1969 floribunda has a wonderful strong citrus scent. Also on the auction list is Let Freedom Ring. Here is mine after a rain. It is a gorgeous red and a great rose to photograph. It lasts well in a vase. Many many thanks to Burlington Roses, David Austin Roses, K & M Roses, Star Roses, Tyler Francis and Weeks Roses who so generously donated roses to our auction. Many thanks to members of MEVRS who donated too! 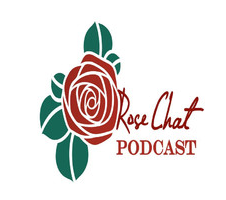 Join us each week for the Rose Chat Podcast. This top rated gardening podcast explores the different aspects of roses. With topics ranging from where to plant roses, how to select roses for your garden as well as how to maintain them to achieve the garden of your dreams. You’ll hear from the world’s foremost authorities on growing roses, top authors and poets as well as take a look at roses in art, literature and history. Hosted by award winning rosarians Chris VanCleave and Teresa Byington, each of whom bring a unique perspective to the wide world of roses. You can find Rose Chat Radio Podcast here or go to iTunes and subscribe. Check out the Articles page of our website. There are many fine articles there about growing roses in our climate. It’s almost auction time. How lucky we are! Click here for details. I just looked at the partial list of auction roses and saw there is a Baby Grand. It’s a Danish miniature. It was the first miniature to look like an old garden rose. I have one in my garden. It’s bloomed really well for me. It’s a great little rose to tuck into a small spot in your garden. There are some nice roses on the list. Click to download the Auction Catalog. 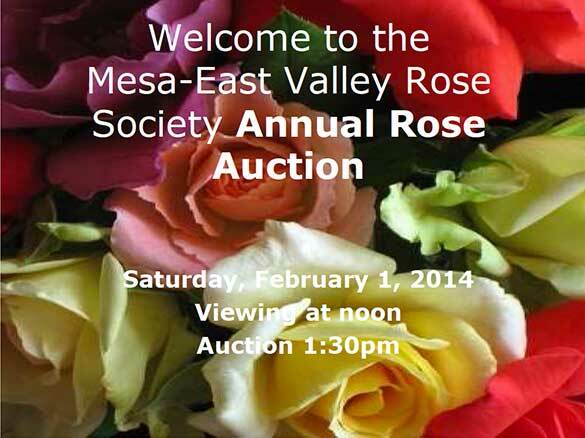 Below is the 2014 List of Auction Roses. Both are works in progress so check back for updates. Select varieties that grow to the size, height, width and depth of the garden area available for your roses. Matching the garden area with the rose selection will make life easier and reduce the required care and increase the long term enjoyment of your roses. The selected area should receive about six hours of daily sunlight. 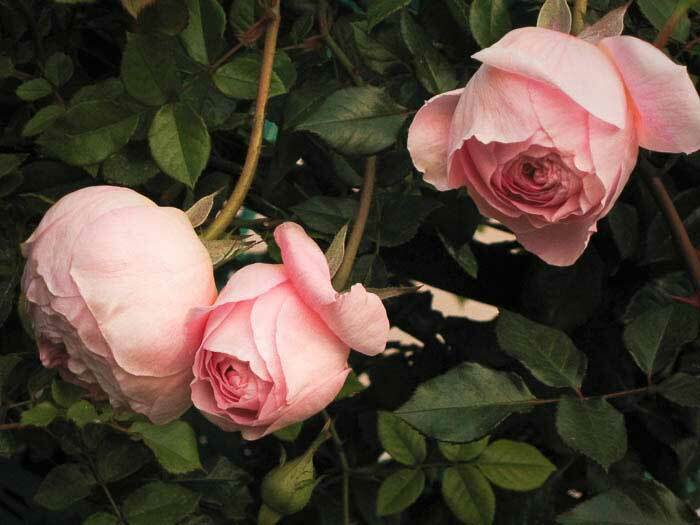 Good horticultural practices tells us that through good pruning the results will be that as the rose comes out of the winter semi-dormancy it will have improved plant vigor, growth of new canes and higher quality and larger blooms. 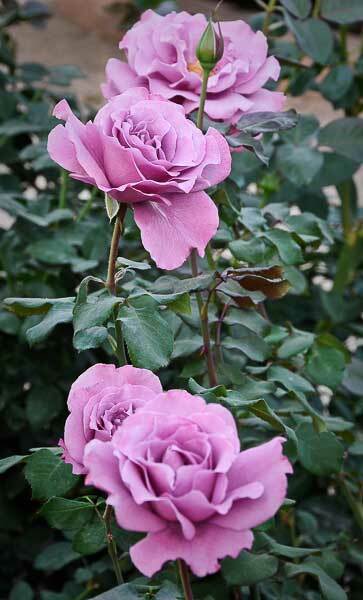 We have these and many other excellent articles on growing roses on our Articles page. 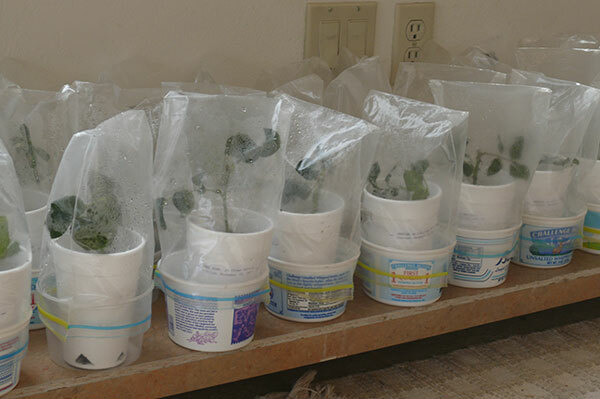 Below is a picture showing clearly the foam cups (with holes on the bottom) covered with quart-size plastic bags, sitting in 8oz containers. Lately I have been using the see-through container (one at left in the picture) that makes it easy to see when the cutting has rooted and roots start poking out through the holes in the foam cup. Keep in mind some roses are easier to root than others. Rita Tall lives in Tucson, Arizona. 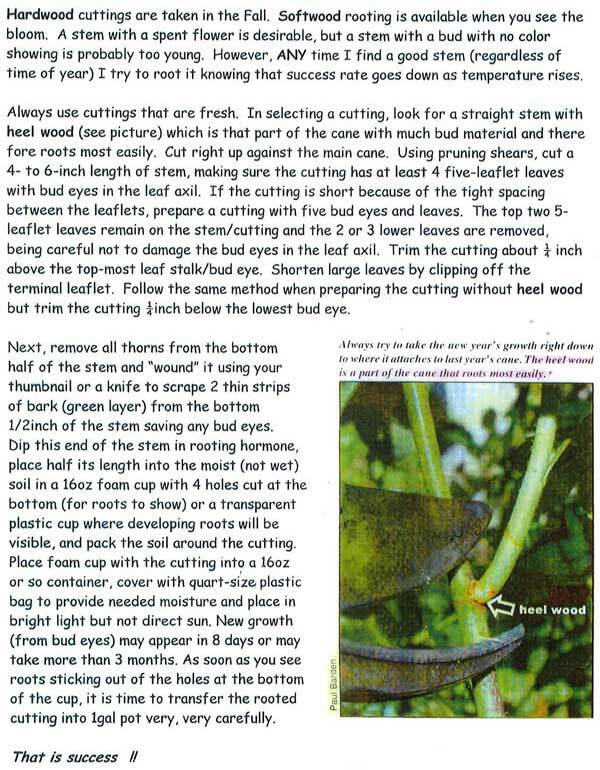 Download Rita’s article on Starting Roses from Cuttings. I have a 7 or 8 year old Ingrid Bergman rose bush that I got from a nursery in the South on Fortuniana root stock by mail. It is a beautiful rose bush but my wife planted a peach tree in front of it and it butts against a high brick wall on the North side of my house. It needs to be moved. Advice is greatly appreciated. Thanks so much. 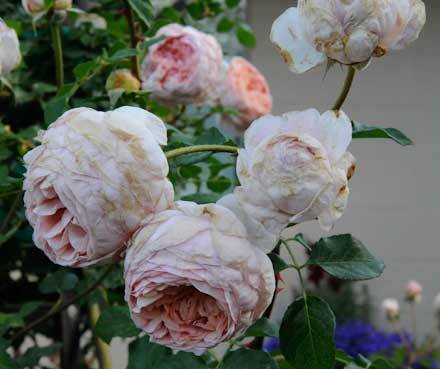 There is a great article on moving Fortuniana Rosebushes in our August 2007 Rose Lore newsletter, beginning on page one. My experience here in the valley is a little different, not unusual. I agree with trimming the bush down to about 1/3 BUT I believe in leaving as much leaf as possible – my reasoning is the sooner photosynthesis can work and help generate new sugars the better. Keep the ground WET for about a week (water every day), then back off slowly (every second day for two weeks) to your normal January watering schedule. As we do not have winter here in the valley – I feel any time between December and February the best time to move a Fortuniana bush. Hello, I am preparing to plant some bare root roses this weekend. I would just like to know if i should mix rose food with the mound where the rose is supposed to “sit” on. The instructions from MCC Rose Garden states that I should scratch Disper-sul in the bottom of the hole and then add Triple Super Phosphate as a clump. Then form a mound on top of that with a mixture of forest mulch/compost, native soil and perlite. So would it be beneficial to mix in food with the compost/soil/perlite mixture? Would it be OK to add gypsum and bone meal to either the mound or the backfill (or both)? I’m really excited to start some roses and I want to get right. The Disper-sul is to help drainage with our heavy clay soil. The Triple Super Phosphate is put in as a clump because it does not migrate through the soil and if it is mixed with the soil the chemical reaction with our high salt content makes it inactive (so the outside combines with the soil but the center remains available for the plant. We do NOT add fertilizer to the mound when planting bare root roses because it will likely BURN the new hair roots. We recommend only fertilizing AFTER the first bloom. If you use Disper-sul you will not need Gypsum. They do the same thing, so you can use either. Bone meal is OK to use as it is organic and breaks down slowy so will not burn the new roots.